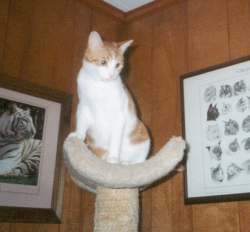 Moxie, the "firehouse cat", was found in the middle of the woods in December 1997 - his mother had been hit by a car. He was only about 8 weeks old at the time. When Cathy saw him it was love at first sight, and he is now a cherished member of her household. These two boys were initially named Oliver and Fluffy, but Fluffy wasn't really fluffy, so Oliver stuck for both of them. Jessica and John now call them Oliver 1 (bottom) and Oliver 2 (top). O-1 likes to curl up in the sink while Jessica gets ready in the moring and also enjoys a snuggle under the covers. Both O-1 and O-2 enjoy "helping" in the kitchen, as above. Jessica writes: "We enjoy our Olivers so much! It amazes me that they've been so affectionate towards us since the first minutes we had them home!" 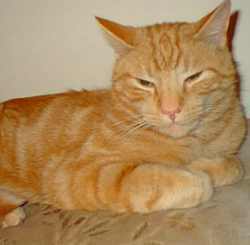 Gordo was adopted by Patt and John in November 1998 (along with Baxter) at approximately 2 years of age. While he is a fairly mellow boy, he has a few bad habits that need to be worked on, namely, trying to run out the front door, biting, and begging for people food. Time and patience will help Patt and John change these bad habits. 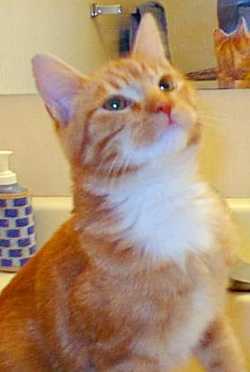 Otherwise, Gordo gets along fairly well with the rest of his family. He is the 12th 'Kitty Angel' for Patt and John. 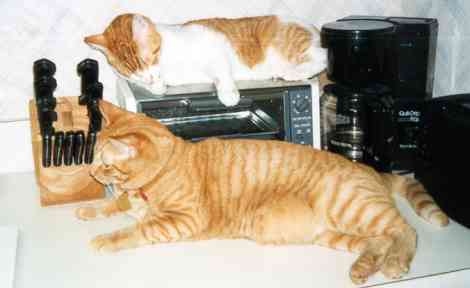 Baxter was turned in to Kitty Angels with his siblings in October 1998. Adopted by Patt and John in November 1998 (along with Gordo) at approximately 5 months of age, he seemed a bit nervous. Shortly after being adopted, he came down with an upper respiratory infection and had to be isolated for a week and a half. During that time, he and Patt became very close, and a special bond was formed. Now this little guy always says 'hello' to his new mom, and keeps himself busy by playing and exploring. He is the 13th 'Kitty Angel' for Patt and John.